Our school canteen offers a wide variety of healthy snacks and lunch options for our students. Lunch orders are made by students from 8:30am to 8:50am each morning at the canteen window. The Kidman Kafé aims to provide options for people who have food intolerances, such as gluten and egg. Deb Hook, Canteen Manager, is happy to discuss dietary needs, clarify what options are available and possibly source some other possibilities. Our canteen does not stock nut products, though care should be taken to check food packaging as some products may contain traces of nuts. 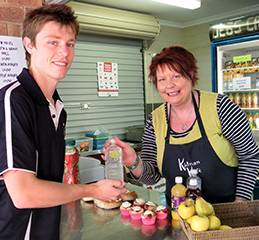 The Kidman Kafé offers the opportunity for parents and students to help out. Training in food preparation and service is available. Further information and volunteer applications are available from Deb Hook, Canteen Manager ph 08 8566 2203.